New Passports are issued strictly in the order in which the applications arrive. The majority are processed and returned to the applicant within five days, however there are occasions when this is not possible. Please allow at least 14 days for your passport to be issued. They are returned to the owner using standard second class mail. If you wish to speed that element of the process up then please attach a prepaid recorded delivery or special delivery envelope – one or two passports are charged at Large Letter under 250 gm, 3 passports at Large Letter up to 500 gm and 4 and over are charged at the ‘Packet’ rate. Transfers of ownership are normally processed on the day of arrival and returned the following day. The passport is a bound document containing an identification silhouette of your animal, its name, date of birth and description. Details of the owner are held, together with the breeder; where known. The animal is registered and allocated a unique reference number. There are also pages where records of vaccinations and any other form of veterinary treatment should be kept. The prime purpose of the document is to ensure that any equine that has been treated with medicines not intended for use on food producing animals cannot enter the food chain. In the United Kingdom most people are horrified at the thought of their beloved horse or donkey being eaten, but in the rest of Europe, this is commonplace and, being a member of the European Community, these laws affect us all. Once you have your passport, it is held by the animal for life, although should be returned to the issuer for updating whenever any details alter e.g. Change of ownership, castration, etc. There will be a charge made for applying these amendments. The Statutory Instrument for Horse Passports (England) Legislation 2004 can be read in full on-line or downloaded from Defra. Proposed changes to the way Equines will have to be identified are under discussion and any changes to current legislation will be notified here as it becomes available. It is worth noting that for the purposes of donkeys registration and passport issuing are inter linked and the donkey will be assigned a registration number in the correct register for its status. A donkey with parents that are themselves registered in the Pedigree Stud Book will be registered as progeny within the Pedigree Stud Book. Those breeding conforms to Studbook rules for entry to the Pedigree Studbook, i.e. a pedigree showing four immediate generations clear from any inbreeding, where the parents were aged four years or older at the time of conception, and who have no other obvious barrier to progressing within the Pedigree Studbook may at four years of age be inspected by a veterinary surgeon appointed by the Donkey Breed Society for freedom from hereditary diseases and if passed will be elevated from the Pedigree Stud Book progeny section. Imported donkey who are themselves already registered in a Pedigree Studbook for their type in Europe will be accepted into the Donkey Breed Society Pedigree Studbook with their entry marked as European, whilst imported donkeys registered in a stud book from outside the EU will be entered onto the Foreign Bred register. Other donkeys will be entered into the most appropriate register according to their status, with all donkeys attaining at least the minimum entry level which is the General Register. Miniature Donkeys, will be placed in the General Register at birth and where their pedigree and breeding conforms to the general rules for entry with regard to pedigree and age of parents at conception, may be measured at maturity and if they are still under 36 inches in height will be assigned a Miniature Register Number and an entry in the Miniature Register. The Donkey Breed Society is unable to transfer ownership or issue replacement passports on behalf on any other PIO, each document must be returned to the appropriate organisation for its administration; contact details can normally be found inside or on the cover. If you are choosing an option for members only, please add your membership number to the order notes otherwise we will not be able to process your order. Please note that you must download, complete and verify the application form with a vet before any payment is made. Forms can be downloaded in the next section ‘Equine Application Forms’ below. Please read before starting, as any errors or omissions will regrettably result in the forms being returned to you. Please complete the application form for a passport, in accordance with the instructions given. All equines, must now have a microchip inserted in the neck prior to application and the details included on the form, so have the form present when the veterinary surgeon comes to carry out the procedure. If you do not understand what is required, please contact the Administrator – phone no: 01691 648168 Once the form is completed, please send it, together with a cheque for the correct amount, made payable to Donkey Breed Society, to the address on the front cover. Please ensure that you print clearly in block capitals – you may know your address, but we don’t and need to be able to decipher these words accurately – so please BE CLEAR! Name – Name must be not more than 25 characters. If you wish to add a prefix, it must be registered with the Central Prefix Register for use through the Donkey Breed Society Duplicate, misleading or distasteful names are not permitted. A distasteful name is one, which, in the opinion of The Donkey Breed Society Stud Book Committee, is distasteful and / or likely to cause offence, in which case, the owner will be asked to provide an alternative. Colour – This must be the main body colour. For exotics (such as zebra family), the colour should be given as ‘black/white striped’ or similar as appropriate. The colours suggested below can be used singly or jointly (e.g. grey/brown) with the addition of a qualifier such as ‘pale’ or ‘dark’. Please note that whilst a ‘white’ horse is always referred to as ‘grey’, donkeys can be either white or a steel grey, so please differentiate between the ‘greys’ if possible e.g. grey (white) or grey (steel grey). White – ‘white’ and ‘grey (white)’ are the same – use whichever you prefer. Place of birth – Please enter the county (if born in UK) or country and district (if born abroad). If place of birthis not known, please enter ‘unknown’. Height – measured to wither (highest point at base of mane). May be entered in either hands (units of 4 inches) or centimetres, please ensure you specify which! PLEASE DO NOT PUT THE HEIGHT IN INCHES. It is a legal requirement that only a Veterinary Surgeon can implant a microchip into an equine. Having done so they must then sign the application form on page 3 to confirm that it is in place and active, and to add the barcode to page 5 across the printed boxes above the silhouette, and sign the declaration of authority on page 5, but after that procedure has been carried out; the owner may complete the written identification and silhouette diagram with a description of any whorls and markings. Unknown donkeys must be scanned for any pre existing microchips and the code recorded where one exists, and its location marked on the silhouette diagram, in which case there is no requirement to insert another. Once the microchip has been recorded the owner can complete the rest of the form as before. If you are printing your application form at home, please make sure that the silhouette diagram has clearly printed as it is scanned to form a page in the final document, so the image must be well defined. Copies of the forms will be mailed if required. It is now a mandatory requirement that in circumstances where a passport is being issued to an equine who is older than six months when the application is received, that the Section 1X declaration is signed by the passport administrator to exclude the equine irreversibly from the human food chain. If the passport is lost, a duplicate may be requested from the original PIO. On receipt of a completed declaration of loss, appropriate fees and checks, a duplicate passport may be issued, in which part II of Section II will have been signed by the PIO, to permanently exclude the equine from the human food chain. The Duplicate passport will be stamped as a Duplicate, and should the original passport ever be found, it must be returned to the Issuing PIO immediately. If the passport is damaged beyond use, a replacement can be issued. On receipt of the original damaged document and a completed declaration, a replacement passport will be issued in which part II of Section II will have been signed by the PIO to permanently exclude the equine from the human food chain. The passport will be marked as a Replacement Document. In the event of the death of any donkey, horse, or pony, the passport must be returned to the issuing PIO for cancellation within 30 days of the death. Owners are permitted to request the return of a passport following cancellation. Any such returned passport will be clearly stamped ‘cancelled’ and its identification pages invalidated to prevent any fraudulent use. Slaughterhouses will return passports to the PIO concerned directly. The Donkey Breed Society is a DEFRA Horse Passport Issuing Organisation recognised by the EU with Registration Number: 826022 and as such is responsible for issuing equine passports for any donkey, horse, pony or other equine belonging to Members and Non-Members of the Society. Applications must be on a correctly completed, and signed, Donkey Breed Society application form, and accompanied by the appropriate fees. 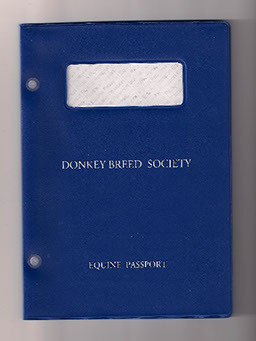 Donkey Breed Society passports for donkeys are issued as Breed Society passports and will contain stud book registration numbers and pedigree information where it is made available. Passports issued to horses, ponies and other equines are for equine identification purposes only, and will contain no reference to any specific breed or type and no breeding history. Where horses and ponies are of a specific breed or type, for which there exists a specialist Breed Society, they should be registered and passported appropriately. Maintaining all records, and data, as required by the relevant Legislation, updating the data as necessary and ensuring accuracy and safe keeping of that data. Ensuring that all persons handling data, processing passports, and handling enquiries from Government departments and agencies, enforcement bodies, members and the general public are aware of their responsibilities, the processes involved, and act in accordance with the Data Protection Act 1998. The Donkey Breed Society is registered for data protection purposes. Telephone calls will be answered between the hours of 10am and 4.00pm every working day. Calls may be diverted to another number if necessary. An answering service will record any calls received whilst another is in progress or those made outside the hours of 10am and 4pm and will be returned within one working day. Mail received by post will be date stamped on receipt and dealt with in order of receipt. All correspondence and e-mails will be answered within 15 working days, or a holding reply sent within 5 days explaining the reason for delay. This holding reply may be sent by e-mail, post, or any other written method. Telephone – All calls to be answered between the hours of 10am and 4pm every working day. Calls may be diverted if necessary. 4.00pm and returned as soon as reasonably possible. Information (Non personal/statistical) to be supplied directly to enforcement bodies on written request; which may be by post or e-mail. Requested personal information which identifies a specific individual will be referred to DEFRA. Information requested by DEFRA to be supplied within the stated time scale. If information is not held, DEFRA to be informed accordingly. Information requests from DEFRA to be received in writing, which may be by e-mail. Details of owner’s responsibilities and legal requirements to be outlined and sent with application form. The Application form to be issued within seven working days of it being requested. If the animal is of a specific equine breed the owner should be advised of the breed society responsible for that breed. An initial check will be made to establish all applications forms have been completed correctly and fully , and that the correct fees are included or arrangements are in place for payment. If any of the forms have not been completed correctly or fully, or if the required paperwork is missing, or if payment has not been received or payment arrangements made and agreed, the passport and/or registration application may not be processed, and should be returned to the applicant, who may fill in any incomplete sections and/or make payment and re-send the application. Additional checks for all applications. Verify from available records that no passport for the animal concerned has been issued previously. Check for authenticity relating to microchipping and veterinary details, veterinary surgeon’s signature and stamp. Check for evidence of unauthorised tampering in passports returned for transfer of ownership or unusual patterns relating to volumes, dates of birth of animal registrations and applications. In the event of such an irregularity being evident, the applicant will be contacted, and unless satisfactory reasons given, the details will be notified to the relevant authorities. In the case of rescued equines, where the existence of a passport cannot be established, a passport may be issued, subject to section 11 being signed and stamped by the Passport Issuer as NOT intended for human consumption. The passport document must be produced in accordance with the relevant EC legislation within 20 working days. Updating of passports should take place within 7 working days providing all the necessary information, and the correct fee are received. All updates will be endorsed with the P.I.O.’s official company stamp. If the updating cannot be completed within 14 days, and the necessary paperwork and fees have been received, a temporary document with an expiry date clearly indicated will be issued, unless there is evidence of fraud. The temporary document will contain at least the UELN and Microchip number (where applicable) and be stamped with the P.I.O embossing stamp. Owners will be advised in writing of the conditions relating to issue of ‘Temporary Documents’, which will be required to be returned before the permanent document is dispatched. by removal of the top right corner of the passport. Passports will be returned to the owner on request after invalidating and after details have been recorded on the PIO database. Passports not returned to the owner, will be retained for two years before being destroyed. Any significant changes will be reported to Trading Standards and to DEFRA and sample copies of previous versions retained. The Donkey Breed Society must comply with the Data Protection Act, and is registered for that purpose. Non personal data will be used and shared for the purposes of administration and data analysis. Personal data, which identifies the individual, will be used internally for Donkey Breed Society administrative purposes, and shared with DEFRA as required by horse passport legislation, and shared with enforcement authorities following an appropriate data request, otherwise personal data will only be shared with the written permission of the individual. All records containing data required under EU 2015/262 legislation and earlier versions will be held on computers running appropriate software. All computers and data retrieval systems are required to be secure, and to have appropriate, suitable current anti-hacking, and anti-virus protection. Hard copy data is kept in appropriate, secure conditions. The Donkey Breed Society must maintain a record and details of any unauthorised alterations or discrepancies found in any passport. Owners names and addresses to whom invalidated passports were returned and on what date. Details of any temporary documents issued. Records to be held for at least 35 years or a minimum of 2 years from date of death of the animal, whichever is notified sooner. Back up of data is made each time entries are made and data may be held on exterior removable data storage devices and held remotely. Any passport returned that appears to have been altered without authorisation, tampered with or in any other way not to be genuine to be reported as soon as possible to Trading Standards in Powys. Any evidence that an individual or group may be involved in Equine passport fraud to be reported as soon as possible to the relevant Enforcement Authority. The Donkey Breed Society mission is to provide our members, customers and clients with the best possible service. We take complaints very seriously, so if you are not satisfied with our service we will do our utmost to put things right. We will acknowledge your complaint by telephone, mail or electronic means within three working days of receiving it. We will begin investigating your complaint as soon as possible after we receive it, and may need to contact you to ask you to supply other evidence to assist our investigation. Failure to co-operate with providing us with sufficient evidence to support your complaint and assist our investigation may mean that we are unable to resolve your complaint. We will endeavour to contact you by telephone, mail or electronic means within 10 working days to advise you of the outcome of our investigations, and to provide you with a solution to the complaint, where appropriate. If the investigation is likely to take longer than 10 working days, we will notify you of the expected time-scale. Where the complaint involves legislation or external operating matters we will refer the matter to the relevant authorities for comment, information and a final decision, and will endeavour to notify you of the expected time-scale of the response from DEFRA or any other relevant authority. If you are not satisfied with the outcome of our investigations, and/or any proposed solution, you may Appeal in writing, within 21 working days; this may be by postal correspondence or e-mail. If you appeal, Donkey Breed Society Council will appoint an Appeals Committee to consider your complaint, and you will be advised of their decision which will be final. A trained person at an alternative location with appropriate software will continue to cover passport issuing and updates in the event of any disruption. If the Donkey Breed Society ceases to trade as an organisation, and/or ceases to have a legal entity or identity, and/or ceases to trade as a Horse Passport Issuing Organisation, then an appropriate organisation will be designated by The Donkey Breed Society to maintain any passports issued. DEFRA will be informed as soon as reasonably possible if another organisation takes over responsibility for maintaining Donkey Breed Society passports and the passport database. The Donkey Breed Society will require payment to be made for transfer of ownership of Donkey Breed Society passports to any designated organisation or other entity. Before a passport can be issued all equines born must have a microchip inserted by a veterinary surgeon. The position of the microchip must be recorded on the identification silhouette, with the page both signed and stamped by the Veterinary Surgeon carrying out the procedure. All applications for new equine passports must be received no later than 6 months from date of birth of the equine or before 31st December of the year of birth, whichever is later. In the event that this timescale is not met, any new applications for equines which are more than 6 months old at the time of application will be processed, but are subject to DEFRA legislation relating to late registration of adult animals, and will be irrevocably signed out of the Human Food Chain by the passport administrator on the date the passport is issued. The appropriate registration fee (see Fees below) must be sent when returning the passport application, and no passport will be issued without the fee having first been paid. A Veterinary Surgeon must implant a microchip into the left side neck of the equine concerned, having first checked for evidence of any previously implanted microchip. If one already exists the reading must be recorded and checked against existing passport databases for a link to any previously issued passport. The Veterinary Surgeon must note the position of the microchip on the Identification diagram at the time and sign and stamp the application form where requested. The microchip bar code to be stuck to the application form where indicated. Once the microchip is inserted and marked on the identification diagram the remainder of the form may be completed by the owner or other competent person. The form should then be sent to the passport administrator at the address on the application form, together with the required fee. Donkeys issued with a Donkey Breed Society passport will receive a breed society passport with as much pedigree information as can be verified through the published stud books of the Society. Horses issued with a Donkey Breed Society equine passport will receive an Identification-only horse passport, known as an ID horse passport. ; in which instance any information relating to the breed and type of the horse or pony is included for descriptive purposes only. In order to comply with Zootechnical and Equalities Legislation, the Donkey Breed Society operates a non-discrimination policy for all Members, non-Members and customers.. Under the terms of the Data Protection Act, the Society has a responsibility to inform equine owners that it collects data (which includes personal information relating to an owner’s name and address and other contact details) and how that data will be used. Information supplied in connection with your application and other equine passport based information about donkeys, horses and other equidae and owner, is held in order for the Society to carry out its mandatory requirements as a passport issuing organisation. From time to time the Society is required to make such information available to Defra and recognised enforcement authorities in order that they may carry out their responsibilities regarding the implementation of the horse passport legislation. Affiliated to the British Horse Society, The British Driving Society, and is a Member of the National Equine Welfare Council.